The ISCNAnalyser class library is realized with Visual Basic .Net as a .Net assembly. Compatibility with COM interoperabilty and use with Visual Basic for Applications (VBA) was integrated for some classes. 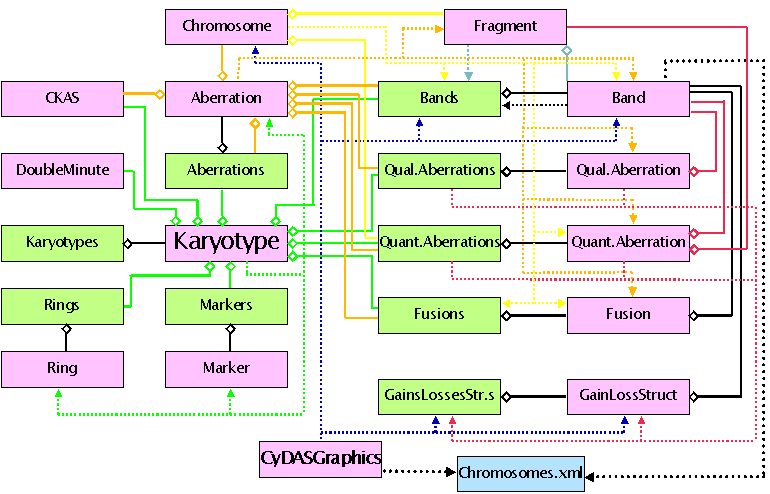 The class library contains a set of classes useful for cytogenetic data evaluation. With the Karyotype class, a karyotype can be analysed for both directly accessible data (e.g. chromosome count) and meta-data which need some calculation (e.g. gains and losses of chromosomal material). With the CyDASGraphics class, results can be visualized. Generally, though virtually all classes can be initialised from a project linking this dll, for most purposes the CyDASGraphics and Karyotype (perhaps also Karyotypes) class will be sufficient, all other classes will have a back ground existence only. Documents describing the process of ISCN analysis technically are also available. The ISCNAnalyser depends on the Resource file ChromosomeData.xml. By default, this file is expected to reside in the same directory as the ISCNAnalyser.dll. But when running it with aspx, the dll is copied into some temporary directory without the resource file; also when starting it from Visual Studio, the dll is copied into the <ProjectFolders>\<your project>\bin directory without the resource file. Hence, in the ChromosomeData class, the switches "gbWebServer" and "gbUseDefaultLocation" were added in the module wide variable section. In the private function "LoadResources" the installation directory is then determined depending on the values of these switches and later made available with the "getInstallDir" function; also the CyDAS application retrieves this value for determining the location of its CyDAS.ini file. If your program is to be run as a desk top application only, set both switches to "false" (this was done when compiling the ISCNAnalyser for the binaries available from the Download section). Otherwise, you may change the paths denoted their according to your needs.